1997 HOME + NEWER GUEST HOME! 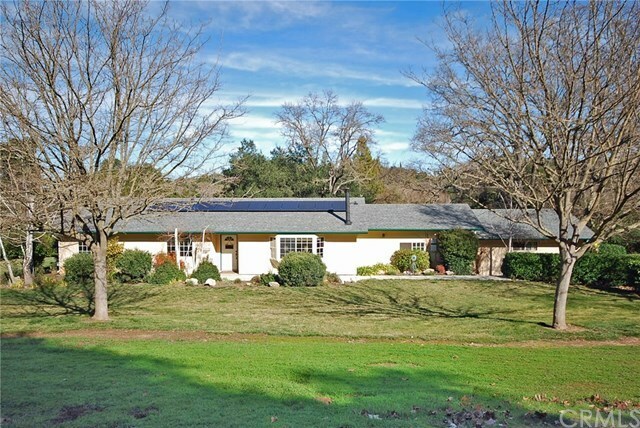 Enchanting property nestled on the desirable westside in a prime location on 2.7 serene acres with perimeter fencing and gated entry. A paved driveway leads to the privately situated homes. The primary residence features 3 bedroom, 2 baths and a 2 car garage. This home has been impeccably updated and maintained. New wide plank, hickory laminate flooring extends through the living spaces and bedrooms. Both baths have been updated with tiled tub/shower combos. The living room features a wood burning stove and bay window. The dining area opens to the well-appointed kitchen. Master suite features two closets and attached ensuite. A mud room is off the dining area, connecting the workshop and bonus room to the 2 car garage. A deck, patio and level yard grace the back acreage along with shade trees, fenced orchard and storage building. The 1 bed/1 bath guest home features living room with gas fireplace, dining area, kitchen, office and attached garage. Both homes features central heating and air conditioning, stucco exteriors and dual pane windows. Property exudes pride of ownership and is move-in ready! View Visual Tour with more photos and information, including room sizes! Directions: From Hwy 101, exit San Anselmo, go west. Right on Monterey Rd, Left on Graves Creek Rd, Right on Balboa Rd, Left on Ardilla. Property is on left hand side.